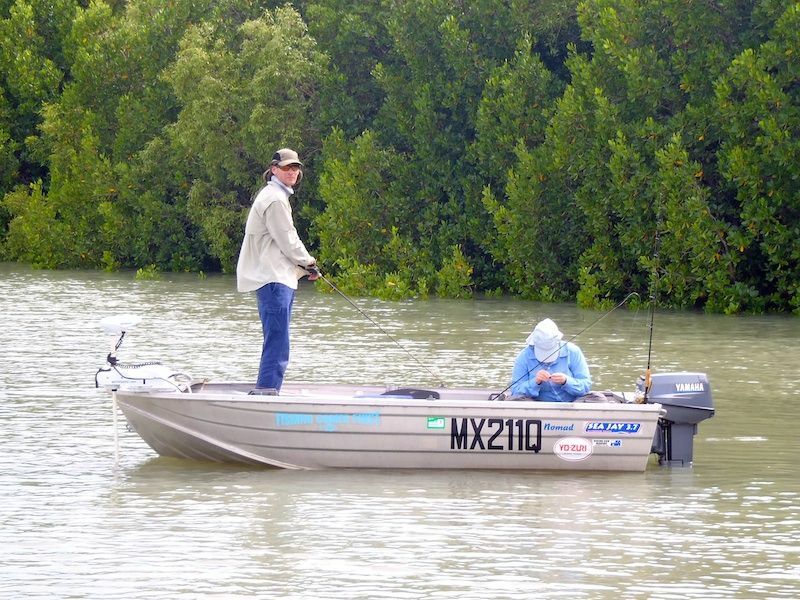 Forum member Dave Little (lil'Dave) and I did a two boat trip yesterday morning to chase the elusive big Barramundi of Cape Cleveland. He brought along his girlfriend Lucie, but had to put up with the company of my Dad! We put in at Cocoa around 6am where the tide was still a little low and we were holding down the noses of our punts as they came off the back of the trailer to ensure we weren't launching the transom into the mud! But we got going without any dramas. We shot out the mouth and started to head up the coast of the Cape. In was a little bumpy in the stiff breeze, but being from the south it was just a little chop that we had to deal with. Mind you, I ended up saturated from the spray by the time we reached our destination! On arrival the wind picked up strongly as a bit of a rain squall passes us close by. It wan't dangerous, even in out sub 4m punts, but it make it dam had for the electrics to hold us in ideal positions. So try as we did we eventually gave up and headed for some sheltered water inside the bays. We fished the last few hours of the incoming tide with all sorts of lures, but failed to find the target fish. Dad hooked up a beauty of a Barra right beside the boat, would have gone well over 1m too... But alas, it was a Barra-couda! I also managed one rubbish fish, a catfish that threw the hooks beside the boat. The two boats separated for a while as we both searched hard for where the fish might be hanging. Dad I eventually gave up and headed back into the mouth of Cocoa to try our luck there. Not that it did us any good! Eventually Dave did the same and joined us for one last try. But he had had slightly more luck than us, he at least hooked a fish! Apparently a nice fish well over 60cm took his little 'vibe'. 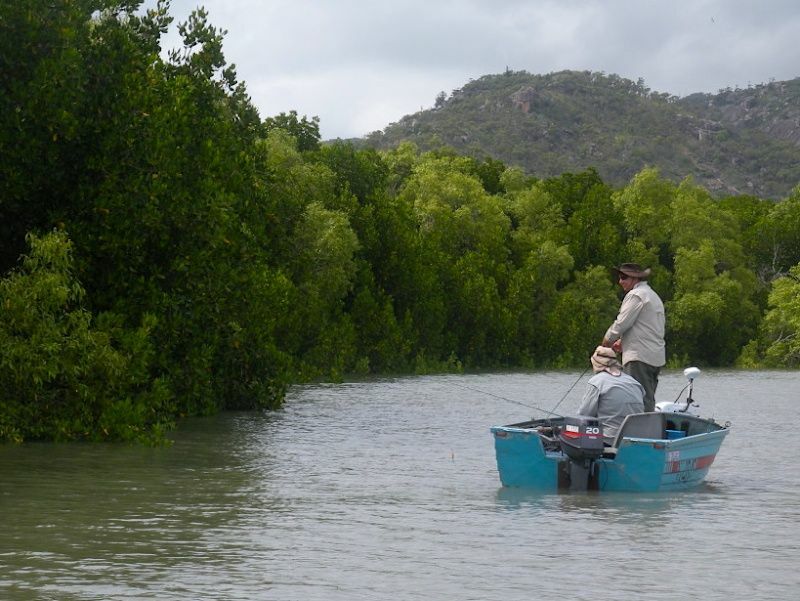 But the weak hooks of this 'fineness' lure didn't last long against our tough Barramundi! Bad luck Dave, time to upgrade all those trebles. We pulled out about 12.30 with the tide much higher than when we launched! With a few discussion of what went wrong we concluded the strong winds had shut the fish down. And with that we headed home for some well earned rest! Well Dave had a good afternoon nap anyway!